Make your choice, Dunn's Marsh Neighbors. 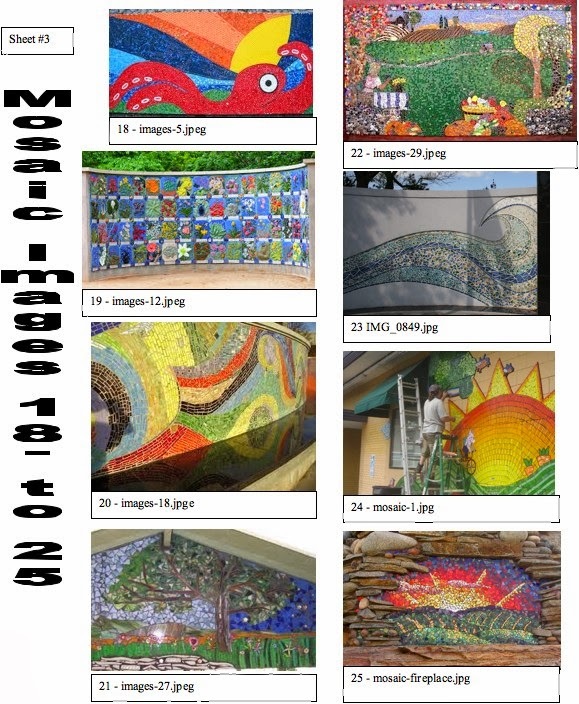 Mosaic artist Marcia Yapp has offered some sample mosaic images to the neighborhood. 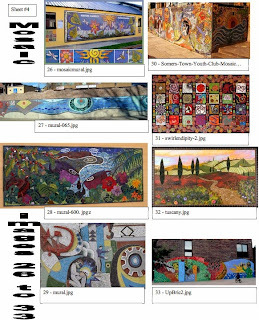 They are examples of the kind of mosaics that could be used on the semi-circular walls that will be positioned on the bike path leading up to the replacement bike/pedestrian bridge that will be constructed over the Beltline just to the west of Whenona Drive. 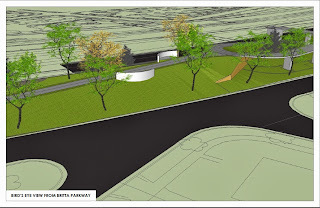 The art walls will be visible from Axel Avenue, Britta Parkway, and the Beltline Frontage Road as well as from the path itself. Keep in mind that the sample mosaic pictures with smaller or more detailed images will not show particularly well on the sample sheets. The “tuscany.jpg” image is shown larger right here to give you an idea of the kind of detail that may not show up as well on the picture sheet. 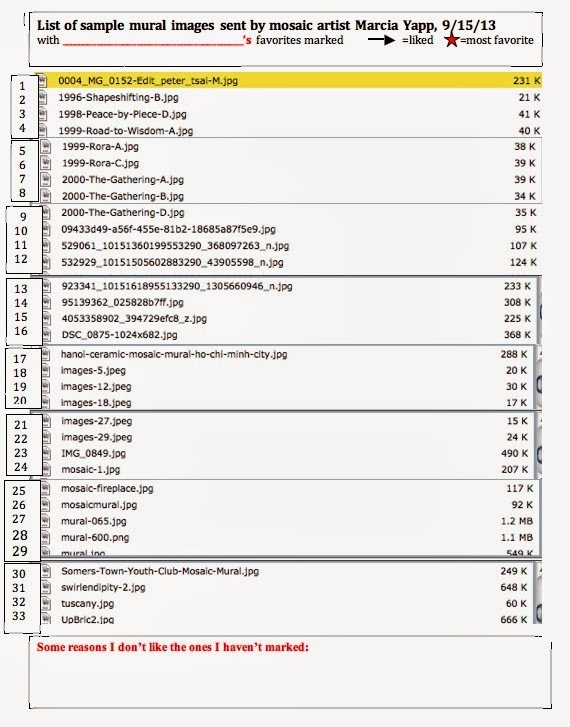 Pictures on the sheets that have very large same-color spaces may appear especially attractive on the picture sheets because it’s easier to see the design in a small image. 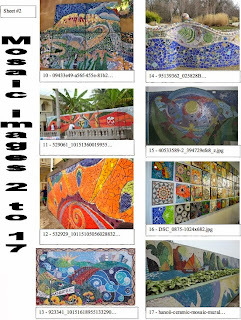 You may send a list of your favorite mosaic choices to the artist by e-mail. The samples have been numbered from 1-33 on the samples list and on the picture sheets. In addition, you may want to explain why you like the samples that are your favorites and, in general, why you don’t like the others. Because the study area is so large, WisDOT is announcing the meetings through the media and the project website: madisonbeltline.dot.wi.gov <http://madisonbeltline.dot.wi.gov <http://madisonbeltline.dot.wi.gov> > . Flyers are also available at local libraries. 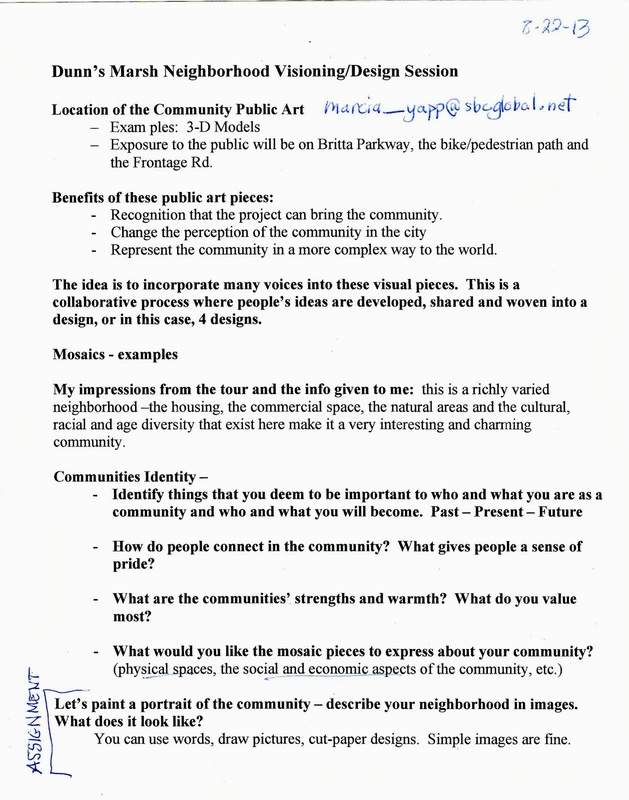 · the new Planning and Environment Linkages (PEL) study process. Each meeting location will have the same information, exhibits, and presentations. These public meetings are a great opportunity for the public to provide comments and get their questions answered by WisDOT staff! Please contact myself or WisDOT Project Manager, Larry Barta, larry.barta@dot.wi.gov <mailto:larry.barta@dot.wi.gov <mailto:larry.barta@dot.wi.gov> > , 608-246-3884, with any questions. Also, please contact me if you would like hard copies of the attachments mailed to you. 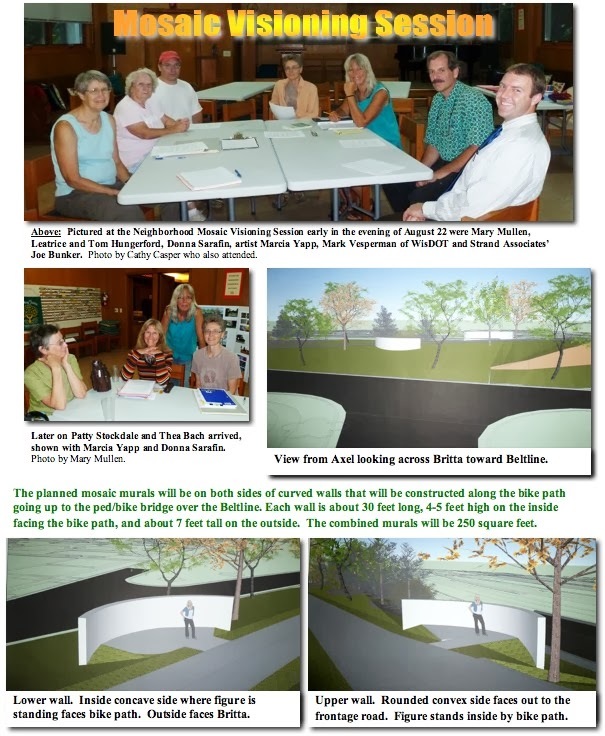 We look forward to seeing you at an upcoming Beltline Public Meeting! The annual meeting of the Dunn’s Marsh Neighborhood Association will be held on Thursday, October 10, starting at 6:45 pm. Please put this important meeting on your calendar now, and plan to come. The meeting is an opportunity to meet your neighbors, share your ideas and concerns, and elect the DMNA Neighborhood Council that will serve for the coming year. Spanish to English translation will be provided as needed, so please let your Spanish-speaking neighbors know about the meeting. Calendar and List of Articles follow this notice of Neighborhood Watch Training which is tonight. 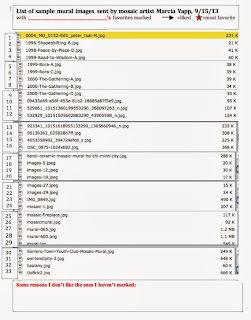 HINT: If the attachments/photo collages are too small to read, go to the website or Facebook. They may appear bigger there. A neighborhood watch is a great way to improve safety in your neighborhood. The Madison Police District will be offering free neighborhood watch training on September 10, from 7 p..m. - 9 p.m. The session will take place at the MPD Training Center, at 5702 Femrite Drive. The training will provide a model on how to form a successful neighborhood watch program, and will demonstrate examples of successful programs. Registration is not required. 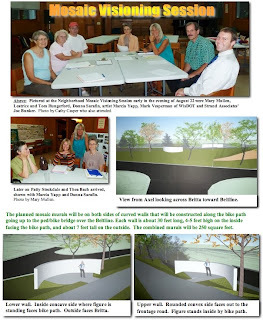 Tues., Sept 10, 6:00 pm - Beltline Study Public Information Meeting, Monona Comm. Ctr. 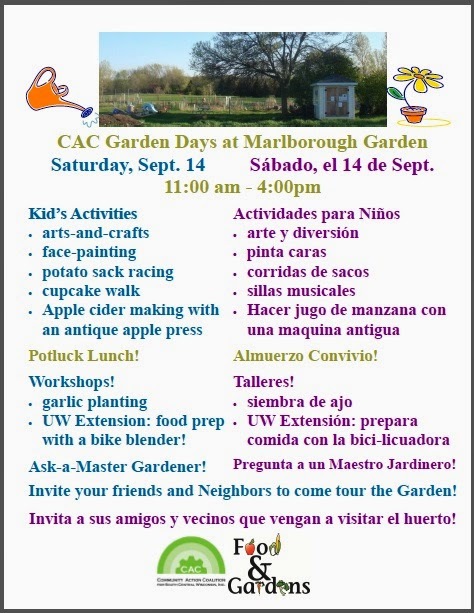 Hike on up to Marlborough Park this Saturday, September 14, for a good time. Come at 11:00. Stay until 4 p.m. if you like. FREE food: Some provided. Bring food to share. Share the attached poster with your Spanish-speaking friends. A lot of our gardeners are native Spanish speakers. Latinos will feel very comfortable at this event. 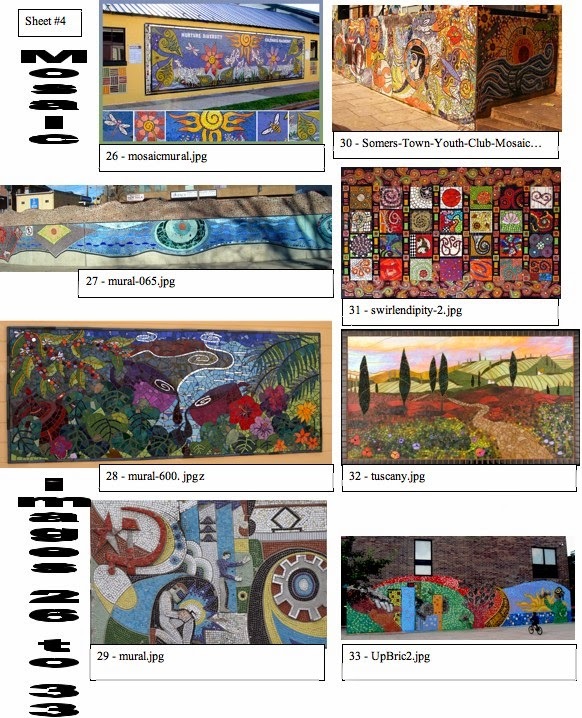 It’s those who make the effort to contribute ideas for the neighborhood mosaics who will see their vision realized. Even though you may not have come to the August 22 visioning session, it’s not to late to put in your 2 cents worth. Read the rest of the article and look at the two attachments to get your bearings. 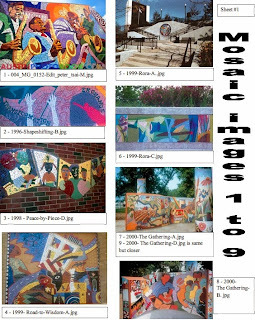 Then communicate directely with mosaic artist Marcia Yapp at marcia_yapp@sbcglobal.net Note that there’s an underline between her first and last name. The mosaics will be placed on both sides of 2 semi-circular walls that will be built along the bike/ped approach to the new bike bridge that will replace the one that spans the Beltline at Whenona. 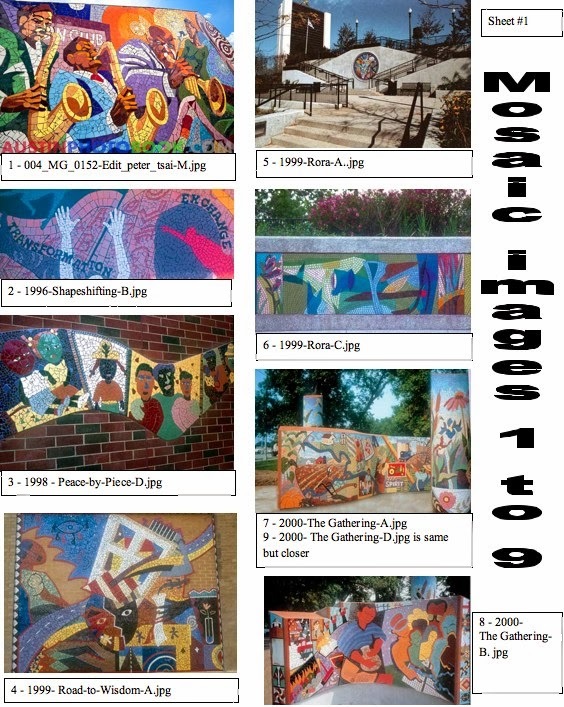 Refer to the attachment “pics mosaic visioning.jpg” to get an idea of what these walls will look like. Each wall will be about 30 feet long with a shorter height facing the path and taller expanse on the sides that will face out to either the Beltline frontage road or Axel Avenue/Britta Parkway. 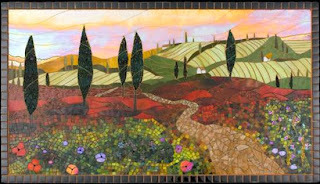 A total of 250 square feet of mosaic will be constructed, divided among the 4 sides of the walls. Divided equally, each side could get a mosaic of about 62 square feet. That could be a 5x12-foot image. However, the inside of the wall is about 4 feet tall, so an image there could be 3x20 feet. 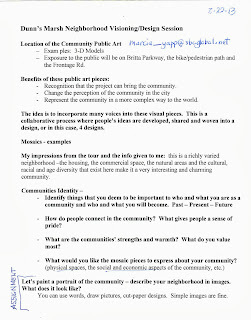 At the August 22 visioning session, artist Marcia Yapp urged people to identify things that are important to the community and to what we want the community to become. Maybe we’d want to somehow trace the history of the Dunn’s Marsh area: oak savannah to farms to subdivisions including the National Homes; community amenities like the skating rink that used to be flooded on Britta Parkway, and the former ice cream stand that became the stained glass store. Maybe we’d like to show the 4th of July parade that takes place in the Crawford part of the neighborhood. Biking was mentioned. Dogs and dog-lovers were named. Marlborough Park and the polls at Head Start were both mentioned as a meeting places. Someone mentioned watching fireworks from Whenona Drive and seeing the Light Brigade on the bike bridge there. One attendee had been inspired by a previous meeting about this project. 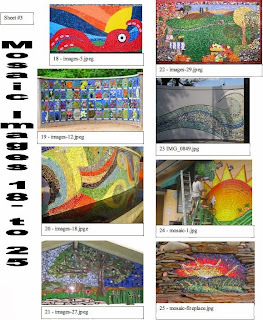 She showed her vision for a panel of the mosaic. It showed a bicyclist looking into Marlborough Park. The park was filled with activity: soccer players, dog walkers, bikers, kids on the playground. Community gardens danced on the hill. In the background was Dunn’s Marsh with the Cannonball Bike Path and the Capitol City Trail as well as Seminole Highway framed by woods on the horizon. In the foreground, a family was barbequing and the Bus #19 marquee made an appearance. Various animals dotted the landscape: chickens, the neighborhood turkey, a frog, Canada geese, a Great Blue Heron, a Sandhill Crane. Now it’s up to you all out in e-mail-land. Send Marcia your ideas. Words, photos, drawings, cut-paper images, crayon drawings, paintings: anything is OK. The neighborhood might be bombarded day and night by noise and air pollution from road construction machinery, but there’s an upside: a changing landscape every day. 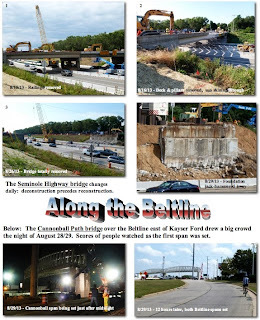 The attachment shows how the Seminole Highway bridge reconstruction project progressed from August 16 when the railings were removed until August 29 when the north side abutment was in the process of being jackhammered away. Have you been wondering what the clanging is during some nights and what those puffs of “smoke” are that accompany each clang in the center of the Beltline at the Seminole bridge location? Paul Watry, the lead on-site Verona Road Project supervisor, explained that the clanging comes from the pile driver. A diesel engine lifts a heavy weight in the framework of the driver. The weight drops from a great height onto the metal piling, driving it deeper and deeper. The puff of smoke is the exhaust from the diesel engine. There’s quite a lot of blue smoke. The attachment also shows the first stage of the Cannonball bike bridge down past Todd Drive on August 29. The final spans were placed over the frontage roads on each side of the Beltline on the night of September 9-10. We were all amazed at the erection of the Cannonball Bike Path bridge over the South Beltline. Incredible coordination between the operators of two huge cranes, with super-high voltage power lines a consideration on the south end. There is a lesson here. Notably, the work was done by the Kraemer company out of Plain, WI, one of the state's largest road builders. Member of the Wisconsin Transportation Builders Association, formerly the Wisconsin Road Builders Association, which recognized they can make money building bike facilities, too, and changed its name and focus to reflect that fact. It's a slow process, but things are evolving to a time in which we will have "complete streets" and roads will be designed and built by "road builders" to be multi-model and to accommodate bikes and peds. Editor’s note: The bridge sections over the frontage roads went up overnight on 9/10 -9/11/13. Weekly construction updates are sent to your inbox and provided on the project website <http://lists.wi.gov/t/865531/1837417/4193/0/ <http://lists.wi.gov/t/865531/1837417/4193/0/> > under the News tab. Updates include upcoming lane closures and traffic impacts for current construction projects, related to the major Verona Road reconstruction. Stay involved and informed with the project website and project Facebook page <http://lists.wi.gov/t/865531/1837417/4194/0/ <http://lists.wi.gov/t/865531/1837417/4194/0/> > . 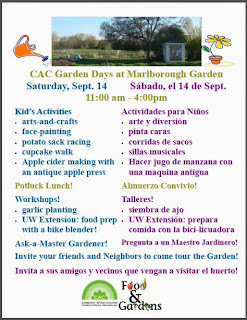 I’ve got some clear dates for ya’ll to come join CAC in some quick-draw apple picking! I realize these are not the most opportune times for people, but they are the only dates and times we are able to accommodate. We will meet down in Cooksville (a 38 minute drive from Madison) at 8:45 am and pick until noon. You must be able to provide your own transportation, carpool, or bike. Apples picked are for distribution to area food pantries. As a thank you for your volunteer help, you are welcome to bring a few home with you. Spread the word to friends, family, gardeners, and neighbors! You can count on us to pick apples on the dates below and always meeting at 8:45am. Unless, of course, it’s raining cats and dogs. Please email me the dates you would like to help pick apples or if you would like more information. I will provide the address where we will be picking and further details in follow-up emails for those who are interested. Need to get rid of old electronics?...The Fitchburg Farmers Market and the Society of St. Vincent de Paul will have a convenient location for you to do so, at 5500 East Cheryl Parkway, Fitchburg, at the Agora Pavilion. See attached flier with information and items accepted. Certificates of Destruction available. Environmentally Appropriate. The Wisconsin Blue Book is the official information book about Wisconsin and its government. It’s a heavy tome of nearly 1000 pages, extremely useful in learning about all the state lawmakers, the structure of government and the responsibility of each agency, statistics about what is produced in the state, and a million other things. It also contains the text of the Wisconsin Constitution. Now you can get it free if you are among the first 350 people to make a request of our state Assembly Representative Terese Berceau. Here’s her offer. I just wanted to let you know that 350 copies of the new 2013 - 2014 edition of the WI State Blue Book will be delivered to my office sometime next week. To reserve your copy, simply reply to this message or call my office at (608) 266-3784. Please include your full name and mailing address. My staff will be processing the books as soon as they arrive and hopefully we can have them in the mail to constituents in a matter of a few days. On Tuesday, September 17 at 2:00 p.m. we will have Craig Culver, co-founder and CEO of Culver’s, talk about his very popular restaurant’s beginnings. This is a great opportunity to hear about how they expanded and how they continue to give back to the community. On Tuesday, October 15 at 2:00 p.m. we will have Steven Bartlett, PR Director for the Badger Honor Flights. These programs are free at the Fitchburg Learning Annex at the Fitchburg Senior Center. There is no need to pre-register. The City of Madison Fire Department received a federal grant to install smoke alarms in 1,000 homes. If you qualify, we will provide the alarms and install them in the correct locations in your home. For FREE! 1. To qualify you must own your home.